For many smart phone users, searching on a mobile device is akin to snacking, according to a Yahoo! Canada executive. They aren’t looking for “a meal of information or delving deep into search results,” noted Nick Patsiopoulos, director of mobile and digital services at Yahoo Canada. Patsiopoulos was speaking at Mobile Media World 09 in Toronto recently. Presenters and panellists at the event included global industry experts, C-level business executives and well-known thought leaders in the mobile marketplace. 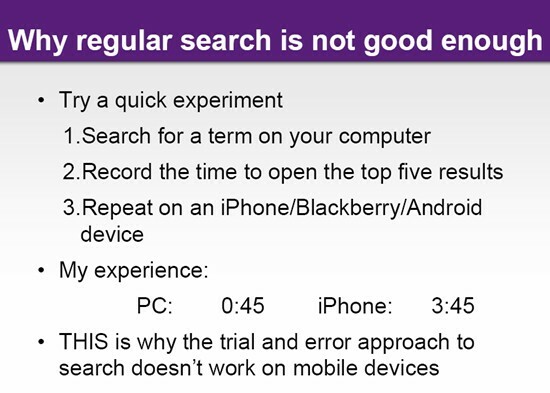 Many aspects of mobile search experience make it very different from search on a PC, the Yahoo Canada exec said. One of these is the user’s state of mind. Mobile users, he said, are likely to be distracted when doing a search and wouldn’t be giving their full attention to the task at hand. (It’s a different story when they send or receive e-mail on their smart phone – their level of concentration is likely to be much higher). But this immediacy, he said,is still sadly lacking in mobile search today, which still very closely mirrors the desktop search model. To reinforce the point, Patsiopoulos cited a “search” experiment he did recently. Using the search terms “toys” and “Toronto”, he first did a desktop search, and then mobile searches using three different devices – the Google Android phone, a BlackBerry and the iPhone. Patsiopoulos said this “unscientific” test still provided certain insights. He recorded the time it took to do the Search and open up the top five results. This is why a trial-and-error approach to search – common on the desktop – just wouldn’t work on mobile, the Yahoo Canada exec said. Another key factor affecting the mobile search experience, he said, is the nature of the device itself. 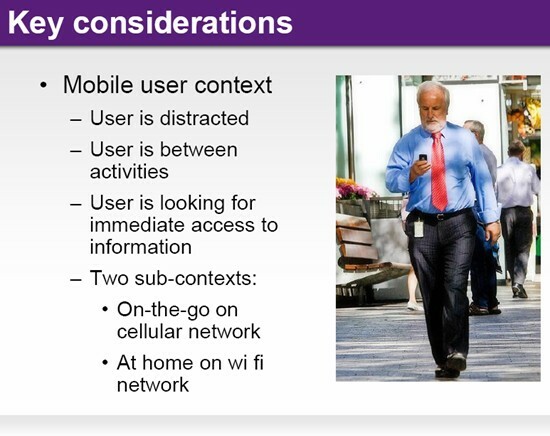 All these considerations needed to be factored in, he said, when designing search services for mobile. The focus on query intent, he said, involves looking at what the search query is, and distilling from that what exactly the person wants. He cited several examples of searching on Yahoo (mobile) to illustrate how this works. For instance, he said, typing in “mexican food toronto” in the Yahoo search bar on your mobile phone would get you a list and links to local Mexican restaurants – as that’s probably what the user is looking for. You could scroll down to get the 10 blue links of Web sites – they’re still there, as a back up if all else fails. He said at the very bottom of the results page is the kind of information you wouldn’t necessarily associate with your search query – but is nonetheless useful. So a user may be presented with different information when typing the same search query – depending on where they are located. Another example he cited was of a search for a flight – AC (Air Canada) 719. He said chances are when someone who types in that query is actually looking for the status of this flight (from New York to Toronto). He said you’re able to drill deeper and get terminals information and much more. The results, Patsiopoulos said, also exemplify “intelligent grouping of information” – as just below the flight data are details about the weather – both at the departure and arrival city. Finally, he cited a financial example. Typically, he said, when a smart phone user types in a company name or a stock ticker symbol – they’re looking for financial data relating to that firm. But while we’re moving in the right direction, there’s still a long ways to go Patsiopoulos suggested. So it isn’t surprising, he said that eight of the top 10 mobile sites are also among the top 10 on the desktop side.